At Norton’s Gas, your safety is always our number one priority. Please take some time to review the FAQ’s below so you are always prepared. Remember . 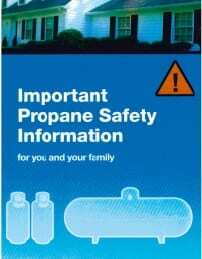 . . Propane is a safe, reliable fuel. Like many other efficient fuels, however, it is highly flammable. That means it can be very dangerous if not handled properly. The most important thing for you to know about your system is where the main shutoff valve is located. If you have any questions, don’t hesitate to give us a call. We’re always here for you! The tank or cylinder equipped with a main shutoff valve. One or more regulators to reduce pressure between the container and your appliances. Gas piping to carry the propane to your appliances. -The tank or cylinder is where the propane is stored. -The shutoff valve turns the propane “ON” or “OFF”. -The regulator controls the amount of gas pressure in the system. -The piping carries the gas to your appliance. Usually the first sign of a leak is the smell. A strong odorant is added to the propane so that you’ll be able to smell it easily. If you smell gas in the house, or near any part of the system, take immediate action to prevent an accident. The ONLY sure way to detect a leak in your system is through a pressure test which we must perform. Do not operate switches, appliances, or thermostats. A spark from one of these could ignite the propane. Get everyone outside and away from the building. CALL YOUR PROPANE SUPPLIER FROM A NEIGHBOR’S PHONE AND LEAVE A CALL BACK NUMBER. 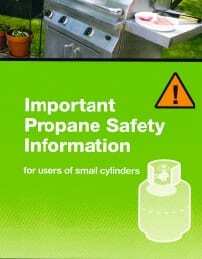 Stay away and leave the propane off until the leak has been found and fixed. Let your propane supplier relight your appliances. WHAT IF MY PILOT LIGHT GOES OUT? RULE #1: IF YOU CAN’T LIGHT IT, DON’T FIGHT IT! Read the lighting instructions. They came with your appliance. If you smell propane, don’t try to light the appliance. Since propane is heavier than air, sniff around the floor before trying to light the pilot. The pilot has a safety device, if you have trouble lighting it or keeping it lit, this device is letting you know that there is a problem. Call a service technician for assistance. If you can’t get the knobs, switches or buttons to work by hand, don’t use tools to force any controls. CALL YOUR SUPPLIER. If the appliance control has been exposed to any kind of water from flooding, for example, it must be replaced by a service technician immediately. IF YOU ARE UNCOMFORTABLE OR UNSURE OF HOW TO RELIGHT THE PILOT PLEASE CALL US FIRST. DO NOT OPERATE THEM UNTIL THEY HAVE BEEN PROPERLY VENTED AND/OR INSTALLED BY A QUALIFIED APPLIANCE INSTALLER AND A SAFETY CHECK DONE. Once a year we recommend you have your appliances checked by one of our qualified service technicians. If you buy a new or used appliance, have it inspected and installed by a qualified propane appliance installer. Properly installed and maintained systems will greatly minimize the chances of accidents, fires, or carbon monoxide risks. IF YOU HAVE AN APPLIANCE OF ANY TYPE INSTALLED BY SOMEONE OUTSIDE OF OUR COMPANY, WE STILL MUST BE CONTACTED PRIOR TO USING THE APPLIANCE SO WE MAY DO A COMPLETE LEAK CHECK AND ASSURE PROPER INSTALLATION. Turn off all valves on your appliances. Turn off the shutoff valve on the propane tank. Call your propane supplier to arrange a delivery. Don’t turn the propane back on yourself. When you schedule your fill you need to be home. Our service technicians must check to see that all safety controls are working properly immediately after refilling your tank to ensure all safety precautions. make the best decision for your home and your family.